Detroit's flag resembles an armorial banner, divided into quarters with the city seal overlaying the flag's center. The first quarter is blue with 13 white stars, placed horizontally in three rows of 5, 4, 4. The second quarter is red with three gold lions, "passant guardant" (walking by with head to the viewer), one over the other, placed so that the middle lion is in the center of the quarter's field, the top lion slightly toward the hoist, and the lower lion slightly toward the fly. The third quarter has a white field with five gold fleurs-de-lis, two centered above three below. The remaining quarter has 13 stripes, 7 red and 6 white, running diagonally toward the lower fly. A gold line separates the quarters and outlines the seal. The seal, with a white background and bordered in gold, is circular and shows two female figures of classic Greek style, standing side by side facing the hoist. The hoist figure is dressed in a long red chiton. A long light blue drape covers her head, left shoulder, and right arm, and extends to the ground. Her head is inclined, as if in sorrow, her right arm points to her right, her left arm is stretched toward the ground. The second figure stands somewhat behind the first, with her right arm on the left shoulder of the other, as if comforting her. She is dressed in a blue chiton, with a red outer drape, a himation, over her right shoulder and tucked into her girdle under her left arm, which points behind her, to her left. Her head is uncovered, her brown hair swept up in classic fashion. Behind the women in the center are red flames; toward the hoist, some buildings on fire with orange flames; toward the fly, buildings untouched. Curved over the top half of the seal is THE CITY OF DETROIT, in black. Horizontally, below the female figures, is MICHIGAN, also in black. In somewhat smaller black letters to either side of the figures at about their knee-level are two Latin mottoes, each of two words, one over the other. The hoist motto is SPERAMVS MELIORA; the fly motto, RESVRGET CINERIBVS, after the Roman fashion of using "V" for the contemporary "U". The seal was officially adopted 26 March 1827. The flag recalls Detroit's early history. The seal commemorates the great fire of 1805, which destroyed Detroit. The hoist figure weeps at the loss of the city, echoed by the motto, Speramus Meliora ("We hope for better things"). The other figure points toward the future, symbolized by the motto, Resurget Cineribus ("It shall rise again from the ashes"). The first and fourth quarters of the flag represent Detroit governed by the United States (1796-1812 and 1813 to the present) using components of the United States flag. The second quarter symbolizes the British control of the city (1760-1796 and 1812-1813) using the English symbol of three lions (ultimately deriving from Richard Lion-Heart). The third quarter indicates the French founding of Detroit (1701-1760) using the fleur-de-lis symbols of the French monarchy. Presented to the city by the designer in 1907. David E. Heineman. The seal was designed by a Native American artist, J. O. Lewis. Soon after the flag was designed in 1907, the city had a flag made. The original proportions were 21:31. It was first flown on 12 June 1908 for "Pennant Day", in honor of the Detroit Baseball Club. For years, most people assumed that the flag was official, since it was used by the city at civic functions. However, as a result of a 1948 inquiry from an advertising firm requesting a copy of the official flag, the city determined that the flag had never been adopted by ordinance, so the common council made the flag official on 20 April 1948. Heineman's original design shows the seal in an oval shape without the name of the city and state, and the mottoes in black on white heraldic ribbons, SPERAMUS MELIORA curved above and RESERGET CINERIBUS curved below. The female figures are shown slightly differently; the hoist figure has her right arm to her brow, and does not wear the drape; the other figure has her right arm about her companion's waist. A gold band surrounds the oval. The circular seal replaced the oval rendition about 1974, and has continued in use. overall, a seal: two Greek figures in front of two buildings, one of them in flames. This image differs from the version at the top of the page in the typical 19th-century ornateness of the frame and fleurs-de-lys, and in that the lions are not the usual heraldic English ones. 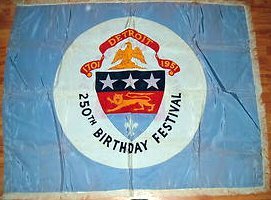 The original 1951 flag for the 250th birthday celebration for the city of Detroit Michigan. 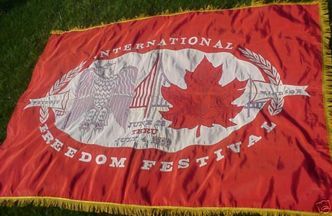 An original hand made flag from the 1st ever Freedom Festival between Detroit, Michigan and Windsor, Canada. This festival continues to this day and this "ORIGINAL 1959 FLAG" signifies the start of a lasting relationship between Detroit and Windsor. The flag was custom hand made by Geo. P. Johnson Co. out of Detroit. It is made of nylon and very well done. It is quite fancy and in the center is the Ambassador Bridge. It is a large flag that measures approx. 70 inches long by 43 inches tall. The success of the first International Freedom Festival, themed "Partners in Freedom," in 1959, paved the way for the Detroit-Windsor celebration that continues to develop and grow in popularity on both sides of the Detroit River. The International Freedom Festival is a 75-year-old idea that became a reality 48 years ago. In 1930 Paul Lutzeier, a student editor at the College of the City of Detroit - later to become Wayne State University - conceived the idea of a joint Independence Day celebration between the citizens of Detroit and Windsor. He felt the United States and Canada shared not only a geographic border, but also a spiritual bond. The fulfillment of Lutzeier's dream was almost 30 years in the making. As originally stated, the purpose of the festival was to promote an annual civic festival...for the purpose of dramatizing the friendship between the American and Canadian people and publicizing this friendship as a worldwide example of the benefits derived under "free government." Business and civic leaders gave their support to the concept, and the first International Freedom Festival was held in 1959. Its theme was "Partners in Freedom." Queen Elizabeth II made an historic visit to Windsor and it was also the beginning of a long-standing tradition of fireworks, sponsored by Hudson's. Today, the Target Fireworks is the centerpiece of the entire festival.